NOTE: Past and aspiring participants for 2019 need to begin plans and submit comments on the Blanc et Noir Facebook Group page to join the planners for next year! 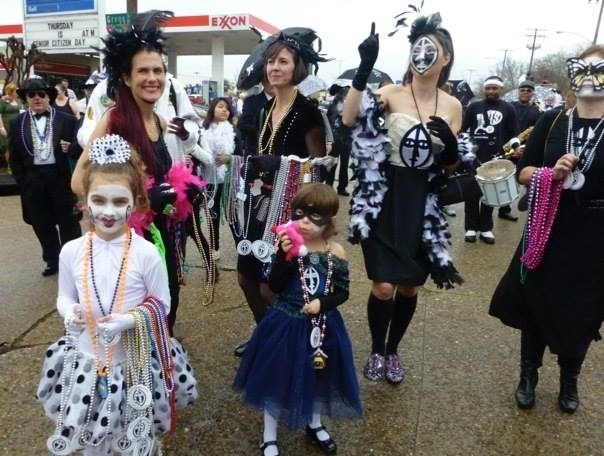 You are officially invited to join the Blanc et Noir Marching Society as we get funky and dance through the streets of Highland to our Nola-style brass band in the Krewe of Highland Parade on Sunday, March 3. Painted faces or masks and whatever black and white get-up you can get down with will be our un-uniform uniforms. You’ll get a small bag of pecans which you can decorate as your signature throw (think the Shreveport version of a Zulu coconut). We gather around 11:00 AM for a pre-parade party in the lovely home of Marion Marks. There will be gumbo from Herby K’s, Gambino’s bread & king cakes, beer and other good stuff (let us know what you can bring). After we fuel up and get the good times rolling, we’ll take a group photo on the lawn then walk together to the head of the parade and bravely start the KOH procession at 2:00 PM as we have done for the last ten years. One conundrum: kids love being in the parade but also don’t want to miss actually watching the parade. Since we are the first group, we can march the route then at whatever point you see your friends (or your introverted spouse😜) on the sidelines, you can split off and camp out for the entire show and throws. For the route, kids can ride bikes (which can be tricked out in black and white), be pulled in a wagon or pushed in a stroller (littles). And they can “throw” whatever they want—buy some doughnuts or candy and let them get in on the fun. Mardi Gras is early this year so let me know ASAP if you want a spot! Confirm your membership by paying Robert Trudeau or Madeline Kawanaka your dues: $40 for singles and $60 for families. If you do Facebook, join us there for updates/changes and opportunities to get involved. 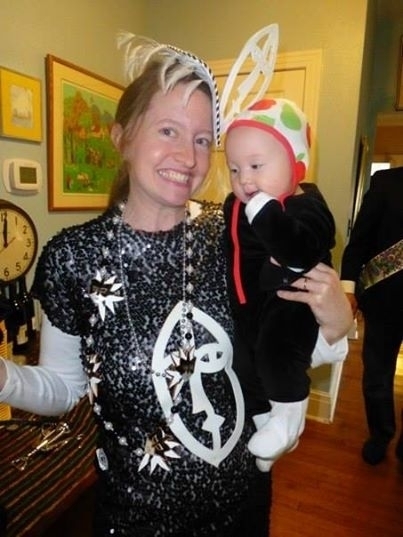 Also, make this your own Krewe by inviting your friends—all are welcome—but they need to book soon! 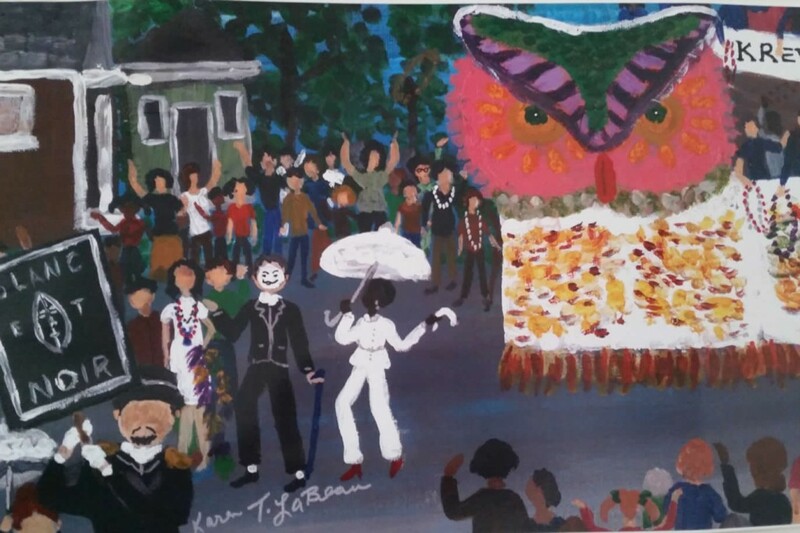 Past parades symbolically have included over 100 Mardi Gras floats, antique vehicles, marching bands, and tractor-pulled floats or other mechanized platforms that enable the entertainment and festival that Mardi Gras festivities are expected to have. 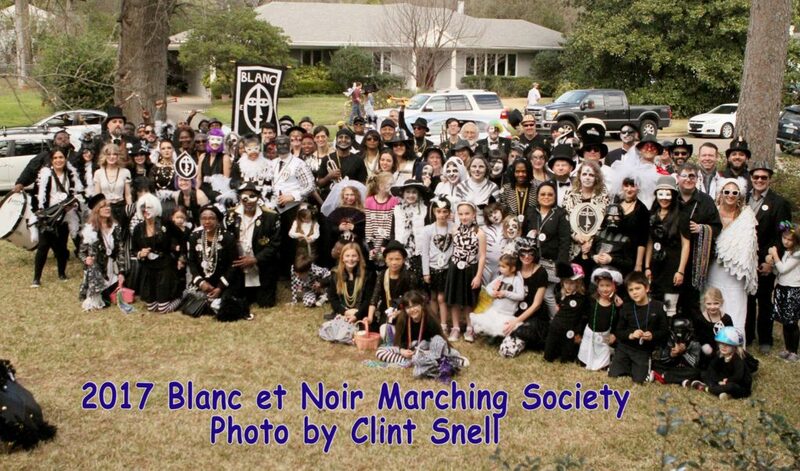 The Blanc et Noir Marching Society is a traditional marching group, started by Mardi Gras historian and traditionalist, teacher, and artist Robert Trudeau; and artist, dancer, teacher and New Orleans native, Jerry Davenport. Accompanied by a New Orleans-style marching jazz band (in previous years the Grambling University Jazz Ensemble)while 2016 was an ensemble of the Grambling Band jazz alumni. Additionally, 2016 the music notes of Matthew Davidson with his band, Jazz Junction entertained at brunch. 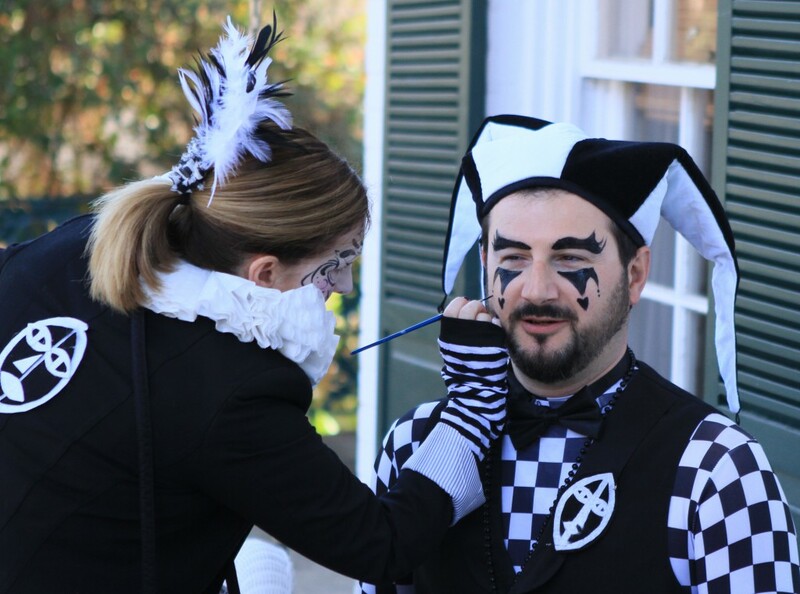 Marchers dress in Black and White and may paint their faces prior to the parade in a manner of masque similar to the traditional Mardi Gras Reveler’s masque. Mardi Gras throws may be doubloons, beads, stickers, stuffed animals or anything a marcher may carry. In past years the throws from the group have included whistles and pins with Mardi Gras slogans or symbols. 2016 promises surprises! 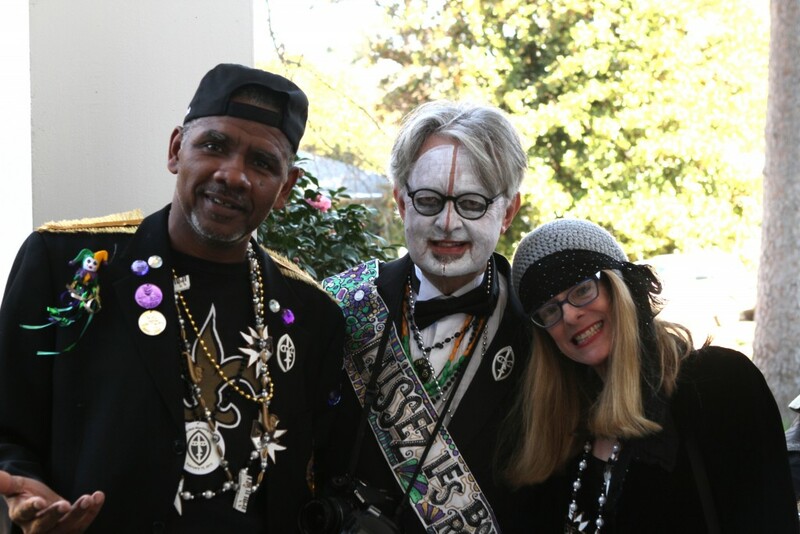 Yet the Krewe of Highland has some of the most obscure and flamboyant societies, such as the “Krewe of Barbeque” who throw wrapped hotdogs or other forms of outdoor cooked food — prepared prior to the movement of the vehicles! And traditional festivities are stretched by such throws as Easter Peeps, Marshmallow critters or other foods or toys that are always enjoyed by the crowd. 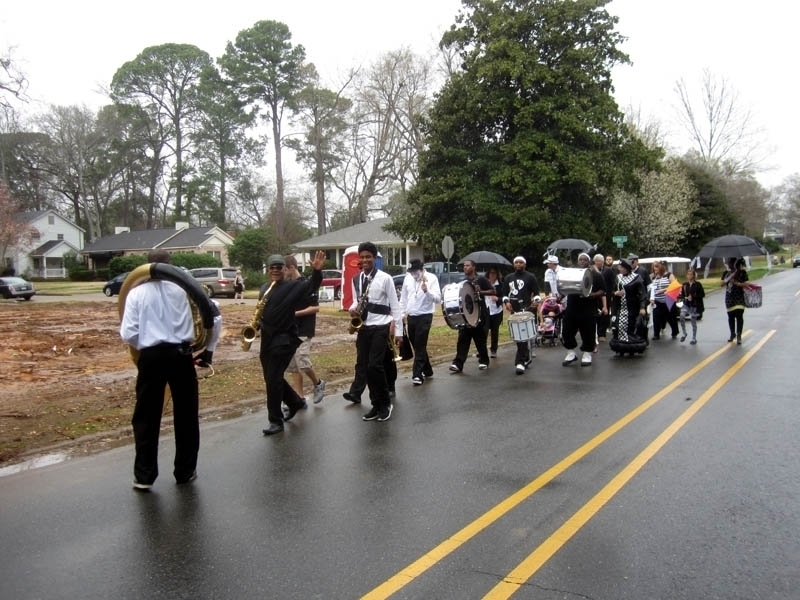 Come to Highland along the traditional parade route streets of Creswell, Highland, Centenary, and numerous cross streets as the parade weaves through the historic neighborhood. But look for the Blanc et NoirMarchers with Jazz to lead the way on March 3, 2019. 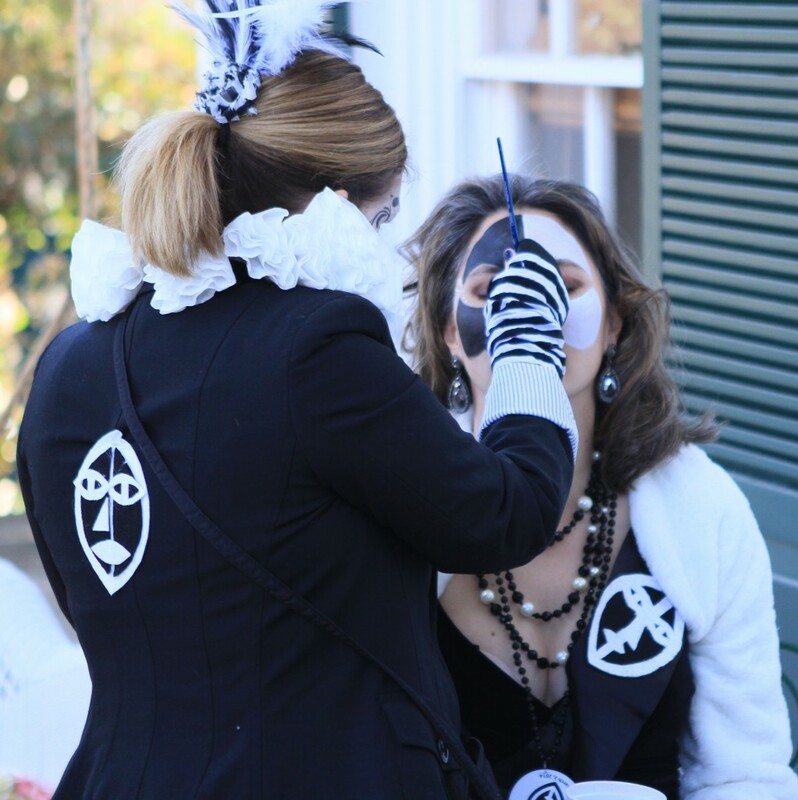 The Blanc et Noir pre-parade brunch is a must for krewe participants to face paint, gather final instructions and the group photo. 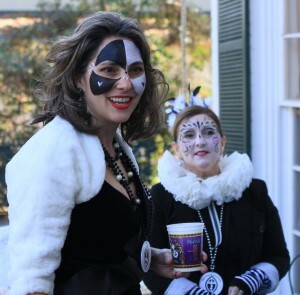 509 Linden is the brunch address, and be sure to contact Marion or Robert via FaceBook to join the krewe, participate in costume, bead and brunch events and for future information. Art by Karen T. LaBeau. Used with grateful permission. Past and aspiring participants for 2019 need to begin plans and submit comments on the Blanc et Noir Facebook Group page to join the planners for next year! View Gallery to see all photos.